I am happy to announce that one of my photographs has been chosen for the book ‘Stone Mothers’ from Erin Kelly. 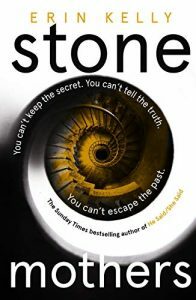 Erin Kelly is the Sunday Times bestselling author of The Poison Tree, The Sick Rose, The Burning Air, The Ties That Bind, He Said/She Said, Stone Mothers and Broadchurch: The Novel, inspired by the mega-hit TV series. In 2013, The Poison Tree became a major ITV drama and was a Richard & Judy Summer Read in 2011. He Said/She Said spent six weeks in the top ten in both hardback and paperback, was longlisted for the Theakston’s Old Peculier crime novel of the year award, and selected for both the Simon Mayo Radio 2 and Richard & Judy Book Clubs. She has worked as a freelance journalist since 1998 and written for the Guardian, The Sunday Times, Daily Mail, New Statesman, Red, Elle, Cosmopolitan and The Pool. Born in London in 1976, she lives in north London with her husband and daughters. Marianne was seventeen when she fled her home, her boyfriend Jesse and the body they buried. But Marianne may not know the whole story – and she isn’t the only one with secrets they would kill to keep.